Transportation accounts for over 40 percent of Connecticut’s greenhouse gas emissions, more than double the share of electricity generation, heating and cooling buildings, or any other sector. Reducing dependence on private cars and transitioning to cleaner vehicles are essential to meet the state’s climate targets and laws. Increasing access to bus and train service, revitalizing our communities with transit oriented development, ensuring urban streets include bike lanes and sidewalks, and moving from gas and diesel engines to electric and zero emission vehicles are all part of the solution. Electric vehicles (EVs) are a win for the environment. Even counting electricity used to charge them, they’re more than 70 percent cleaner for the climate than conventional cars. CFE has worked tirelessly at the legislature and agencies to ensure you have cleaner transportation options. From bringing California’s strong vehicle emissions standards to Connecticut to creating a program to label automobiles with their emissions score, we’re building a bridge from the cars of the past to the cars of the future. 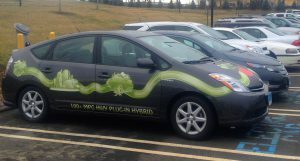 We now co-lead the Connecticut Electric Vehicle Coalition with other environmental, health, and labor groups. Together we’re pushing for electric vehicle infrastructure, education and incentives, grid modernization, and wise use of the state’s funds from the Volkswagen air pollution settlement. These vehicles not only cut climate pollution, but also the health impacts and costs of local air pollution. And going electric saves money! The switch to an electric vehicle saves over $770 per year for the average driver. Congestion causes 64 million hours of delay annually in the state’s three largest urban areas and costs Connecticut $1.3 billion a year. Additionally, lack of transportation is the largest single barrier to employment. Transit ridership has increased in Connecticut and Metro-North is now the most used rail line in the country. But because state and federal investment has not kept pace, delays and other problems are now part of the daily commute. Public transportation is good for the environment and the economy. Riding a bus instead of driving alone for a 20-mile round trip commute can save 4,800 pounds of CO2 per person per year. For every $1 invested in public transportation, $4 is generated in economic return. And for every $1 billion invested in public transportation, 36,000 jobs are created and supported. CFE advocates for public transportation improvements through an alliance with Transit for Connecticut. The coalition of 33 business, human service, regional planning, environmental, transportation, and civic organizations advocates for cost-effective, comprehensive investments in bus transit. We use community gatherings, press conferences, legislative advocacy, and meetings with legislative leaders to build support for transportation infrastructure. To cut transportation emissions and increase quality of life, Connecticut should commit to transit oriented development and complete streets—policies that prioritize walkable, bikeable, livable, sustainable communities around major transit lines. These approaches lower emissions by reducing the need for cars: if more people walked or biked instead of using their car on trips under a mile, it would cut climate pollution by up to 22 million metric tons a year. Connecticut passed a complete streets law back in 2009, but implementation has lagged. CFE advocates in municipalities and at the state legislature to continue make progress on these critical climate and health strategies.